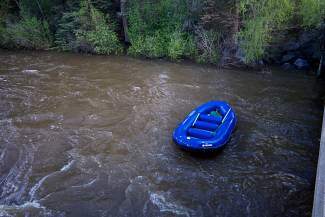 An empty raft floats down the Eagle River in Avon on May 31, one day after the river's water level was at its peak height for the season. Of the eight rafters originally in the boat, three went missing for about an hour and were eventually found after going for a swim while the remaining five went looking for them. Water levels and snowpack are 121 percent above last yearâs, with as much as 40 percent yet to melt at some higher elevations areas, according to Snotel data. EAGLE COUNTY — Rivers are raging, just in time for the GoPro Mountain Games, and could keep running hard through the end of the month. Water levels and snowpack are 121 percent of normal, with as much as 40 percent yet to melt at some higher elevation areas, according to Snotel data. Snotel, or snow telemetry, is an automated system of more than 600 snowpack and water measuring sensors operated by the Natural Resources Conservation Service of the United States Department of Agriculture around the Western U.S. Generally, they’re located in remote high-mountain watersheds. Snotel sites measure the amount of water in the snow. The amount of water snow contains depends on the kind of snow we get. Wet, heavy snow holds more water. Powder doesn’t contain much water, so if you’re counting on powder to provide your water, you need a lot of it, said Diane Johnson, with the Eagle River Water & Sanitation District. The Vail Valley is in pretty good shape for water. Snow water equivalent at the Fremont Pass Snotel site, the headwaters of the Eagle River, had 15.1 inches of snow water equivalent on Friday morning still to melt and run into the river. It hit 17 inches on March 18 and kept piling up until May 17 when it peaked at 25.6 inches. It usually doesn’t melt out until June 18, Johnson said. Streamflow on the Eagle River in Avon may have peaked on May 30, when the daily mean discharge was 4,110 cubic feet per second, which was 249 percent of median for that date. Thursday’s daily mean discharge was 3,650 cfs, 197 percent of normal for Wednesday. Gore Creek in Lionshead may have peaked June 4. “Having 20 to 40 percent of the total snowpack remaining in higher elevations in the Colorado Basin is good overall. 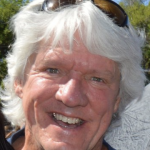 It should help sustain streamflows through the month,” Johnson said. Obviously, the snowpack takes all winter to build up, and then the snowmelt correlates with the streamflow. The historic median peak for streamflows in this area is June 5. After that, it obviously starts to decline, and it’s gone by the first week of July, Johnson said. “The rivers may have peaked, but if it stays hot and we get some precipitation, they could go back up,” she said. The snowpack on Vail Mountain melted out on May 28, according to the Snotel data. Copper Mountain still has 4.1 inches of snow water equivalent. That would normally be melted out by now, Johnson said. Water levels are more than 100 percent ahead of the anemic numbers during the drought two years ago. The 2012 snowpack was 19 percent of normal, followed by 83 percent last year. It was 121 percent this year. Generally, snow continues to accumulate until April 25, when it begins to melt. The latest measurements from the Natural Resources Conservation Service indicate that in the Colorado River basin — that’s us — between 20 and 40 percent of the snowpack remains at higher elevations. If the current wet weather patterns persist through June, then the chances for continued high water levels in the streams in these basins are quite good, the NRCS said. Reservoirs are filling up, which is always a good thing. Reservoir storage in the state is running 95 percent of normal and 62 percent of capacity. That, however, depends on where you are. Colorado’s southern basins report the lowest storage totals statewide, while the northern basins — again, that’s us — are reporting near to above normal totals. The northern basins will have every opportunity this spring and summer to add significantly to their reservoir storage, the NRCS said. Cool and snowy weather in May came on the heels of a series of storms in January that pushed the state’s snowpack from 95 percent to 109 percent of the median. They were hailed by many as “The Storm of the Century.” On the other hand, the century is still young.